Everything you need to know to create a successful freelance career. 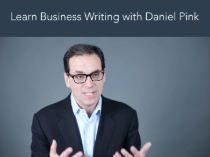 Learn bestselling author Daniel Pink’s top writing tips. Freelancing is doing contracted work for multiple clients and companies. A freelancer’s field of expertise can range from content creation to app development to tutoring, and he or she could also be referred to as an independent contractor or self-employed worker. Over 57 million Americans freelance, including almost 50% of millennials — more than any other generation. Also, based on economic trends, the majority of the workforce is projected to be freelancing by 2027.